Although one of the provisions of the Minsk Agreements is the withdrawal of all foreign military entities from Donbass, Ukraine and its Western allies headed by the US continue to relentlessly allege a Russian military presence in the region. For its part, Russia has denied such allegations, responding that it is an observer country to the same extent that the other countries that signed the Minsk Agreements are, i.e., Germany and France. However, reports periodically come from Donbass which allow us to take a fresh, sober look at the real situation on the ground there. Just recently in conversation with Donbass militia volunteers, I repeatedly heard accounts of Western troops present in the ranks of the Ukrainian army in the capacity of instructors or as active fighters. 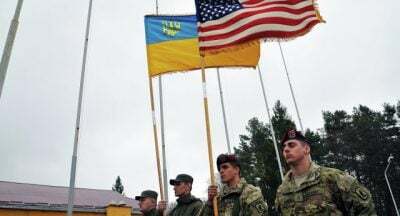 Meanwhile, the Americans and Canadians do not hide the fact that they are training the Ukrainian Armed Forces’ units (such as at the Yavoriv polygon in the Lvov region), but they categorically refuse to admit that their servicemen (usually from commando units) are present at the frontline and fighting on the side of the UAF. On the other hand, my friends from the DPR army have reported that they have especially often observed Canadian and Polish troops present at the frontline. Fresh information just arrived the other day from the Lugansk People’s Republic. The LPR’s Ministry of Internal Affairs’ hotline received a call from a resident of the town of Popasnaya (under Ukrainian control), who said that English-speaking, foreign troops have appeared in the town. The caller described them as dressed in white and grey NATO camouflage and armed with foreign small arms. While accusing Russia of meddling in the conflict in Donbass, the Americans, Canadians, and their European NATO allies are directly involved in the conflict, specializing in training the UAF in sabotage and terroristic warfare, as well as electronic intelligence and radio-electronic warfare. The UAF does not wield such expertise and equipment in the likes of what the American army and NATO countries’ armies boast – and which has now apparently surfaced in Donbass.